42m This high-rise monument has been built like the Arc-de-Triomofi of Paris. 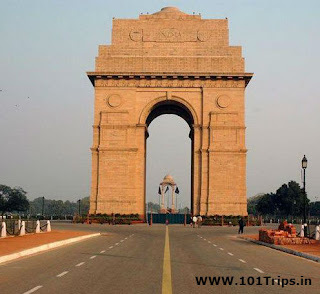 Tourists from all the main attractions of Delhi are most likely to go to India Gate. Founded in the heart of Delhi, it stands proudly as a national monument of India. Under this monument, you can see Anant Jwala, "Amar Jawan Jyoti", who pay tribute to the soldiers who fought their lives for the country in 1971 Indo-Pak war.The original name of this monument was All India War Memorial, which was built in the memory of almost 70000 soldiers. These were soldiers who had sacrificed their lives in the Third Anglo-Afghan War in World War II and in 1919 on behalf of the English army. Although the foundation of this building was laid by his Excellency Duke of Connaught in 1921, but this monument was completed in 1931 by the Viceroy Lord Irwin.